COLORADO SPRINGS, Colo. — USA Triathlon today confirmed the four events that will be contested as part of the 2016 women’s collegiate triathlon season, culminating in the Women’s Collegiate Triathlon National Championship on Nov. 5 in New Orleans. The Women’s Collegiate Triathlon National Championship and three regional qualifiers will showcase the structure implemented in 2014 for the inaugural season, with a maximum field of 75 women racing on a draft-legal 750-meter swim, 20-kilometer bike, 5-kilometer run course. Triathlon received overwhelming approval through a voting process in January 2014 at the NCAA Convention in San Diego by Division I, II and III colleges and universities to be included as an NCAA Emerging Sport for Women, and has a 10-year window to demonstrate sustainability as an NCAA sport option. The season begins on Sept. 5 in Naperville, Illinois, with the central regional qualifier. The east regional qualifier will be held Oct. 2 in Greensboro, North Carolina, and the final regional qualifier will be the west regional qualifier in Berkeley, California on Oct. 8. Teams and clubs will receive an invitation in order to register for the regional qualification events. The top three five-woman teams from each regional qualifier, as well as a minimum of the top two individual women from those events, will automatically earn a spot for the Women’s Collegiate Triathlon National Championship on Nov. 5. The National Championship field will be limited to 75 women comprised of NCAA Varsity Programs and USA Triathlon-registered collegiate club teams. More information on invitation criteria is available at usatriathlon.org/ncaa. 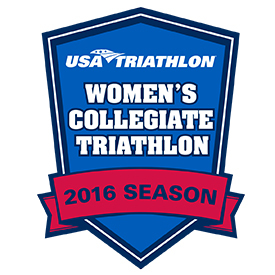 Three of the four races held as part of the 2016 women’s collegiate triathlon season will feature age-group races, highlighting the community aspect noted on the proposal approved by the NCAA in January 2014. Age-group races include the USA Triathlon Draft-Legal Worlds Qualifiers in New Orleans on Nov. 5-6, which will allow top amateur finishers to earn spots to represent the U.S. at select ITU World Championship events. Lake Louisa State Park was the site of the inaugural women’s National Championship event in 2014, as well as the 2015 event. Kelly Kosmo of UCLA claimed victory in 2014, and Colorado’s Abby Levine earned the individual 2015 title. For more information on triathlon as an NCAA Emerging Sport for Women, visit usatriathlon.org/ncaa. For questions regarding events and programming, as well as invitation requests for the Women’s Collegiate Triathlon season events, contact Jess Luscinski at jess.luscinski@usatriathlon.org.